When the war was concluded in May 2009, people thought peace was spontaneous to any war-torn territory where they were trying to put together the pieces of their shattered lives. 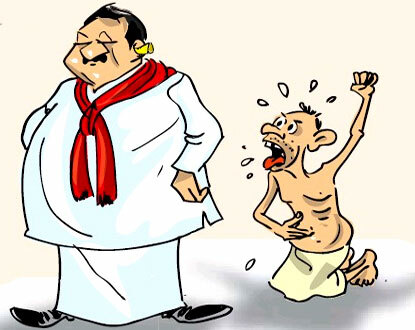 However, going into the third year in the post war Sri Lanka, the question remains as to whether the people are reaping the dividends of peace that came at the expense of so many lives. Looking at the current scenario where the country is fighting the demons of the skyrocketing cost of living and the allegations of human rights violations, the turmoil that has broken out in the island can hardly be called unexpected; whatever the experts say, people are not the blind-followers of trends who would attempt to topple legitimately elected governments just because it happened that way in Arab and the Maldives. Their concerns are those that need remedies. Their voices are those that demand justice and support. In a democracy, people have every right to seek relief from the government as it is the ultimate institution elected by them for their welfare. Hence, quite contrary to what the west-hating politicians may say, their voices are not the echoes that resonated in the Tahrir Square, but simple cries of pain, multiplied by those of so many. No doubt, these demonstrations are disturbing. However, it is doubtful as to whether the authorities made the right choice when deploying force to disperse the angered crowds; their behaviour towards people leaves many questions that demand answers. One may wonder where were then the so-called people’s representatives, who swore by their lives to be the guardian angels of the people. Undeniably, ours is a country where public preference is only synonymous with the preferential votes counted at the election. However, once these ambitious individuals come into power, their policies change overnight: that is the end of democracy and the beginning of autocracy. The brutal force used on people at every peaceful demonstration, organized to voice out their concerns, is nothing but the reflection of the undue power people have entrusted in the governing body. In fact, we live in a country where the politicians are well-known for their ability to stuff words into people’s mouths. For them, everyone is a patriot as long as he/she actively participates in the demonstrations organized by the government. For them, democracy is when busloads of rural people come to the capital to stand in support of the demonic 18th amendment, when ideally they ought to be taking to the streets against it. Ours is a silence that had been long misinterpreted, or twisted into acceptance. Yet, silence is meant to be broken. Voices are meant to be heard when there is a need for it. Hence, the recent incidents should not be misinterpreted as international conspiracies nor should they be called the acts of sabotage by various parties to hinder the government’s walk to peace. Every time a politician stands at a podium, people were attentive to him/her, irrespective of their genuineness and partialities. Now is the time people need a dose of that attention in return. In a proper democracy, it should not be mere plea for space to make the public voice heard- for it is their ultimate right and the government is honour-bound to listen to it. After all, not everyone who takes to the streets is a traitor. Not everyone who shouts slogans is a revolutionist.